How reliable and trustworthy is this online store? Your answers and requests to customer service get handled quickly and effectively. You choosing wisely where you get your vaping gear from, becomes even more critical. DirectVapor quickly grew into one of the major online vape stores in the past 3 years. They provide a HUGE selection of vaping gear. Any type of vaporizer or vaporizer part you’re looking for, you will find it at DirectVapor. The most customer-friendly service though? You always get fast and free shipping with your order. There’s no minimum order-limit. You want to order a cheap $10 vape juice or cheap $5 coil? Do it at DirectVapor, and they’ll send it to you for free. When reading reviews online about DirectVapor, you will find a few examples of customers not being happy with the customer support. However, it seems most of these reports are dated during the times that DirectVapor was coming online. In the beginning stages of any online store, there are always some things which need to be ironed out. In the case of DirectVapor it was their customer service. You will have a tough time finding anything but positive reviews of their customer service in the past year. Their vape juices deserve a lot of respect. 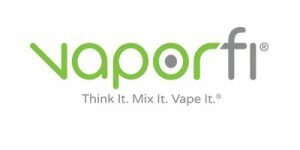 VaporFi is the most transparent and officially approved vape juice manufacturer in the world. There’s ZERO guesswork involved in what it is you’re precisely inhaling with their vape juices. The quality of it is good, but unless they’re on sale, you’re paying more than for comparable vaping hardware from other brands. You get a 30-day satisfaction guarantee on ALL VaporFi hardware. This means you can test out a VaporFi box mod or vape pen, and if you don't like it, return it for a full refund. This guarantee doesn’t apply to their e-liquids, but such a satisfaction-guarantee is extremely rare in the vaping industry. Free domestic shipping on ALL US orders. Your shopping experience doesn't get more customer-friendly than this. With VaporDNA you can be 100% sure that you’re getting your vape gear from a first-class vape store. But with VaporDNA all of their claims are backed by 10000+ reviews, of which 90% are positive. Like you would expect from a vaporizer super-store, they carry an extensive variety of vaping products. They’re always one of the first stores to carry new products. A new box mod with innovative new temperature control technology came out? VaporDNA will make sure they’re the first store to stock up on it. Especially with DNA box mods, they’re always the first store to carry them. Their prices are fair compared to other US-based online vape stores. But in the past few years, have grown their assortment considerably. 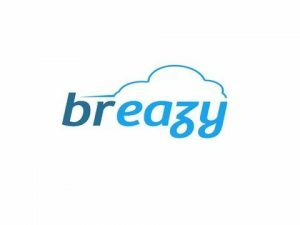 Breazy now offers every type of vape gear that you can imagine: from vape mods to any kind of RBA. They provide the widest variety of juice brands that you will find in any vape store. The variety in models is not the best. You will find a wider variety of box mod models at VaporDNA or DirectVapor. But their outstanding customer service more than makes up for it. If you look at reviews.io, you’ll see a whopping 91% of reviewers recommend shopping at Breazy with an average rating of 4.5 out of 5 stars. With Breazy you can be sure you get top class customer service and an extremely user-friendly shopping experience. 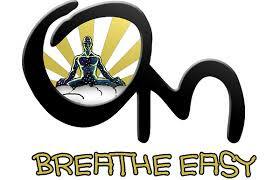 OM Vapor is a vape juice manufacturer which provides high-quality vape juices for a very modest price. They provide results of independent 3th-party tests that prove their products are clean, and they are free to be seen for anyone that’s interested in them (on their website). Great quality vape juices for a very modest price (for the price you won’t find anything better). OM Vapor is the online vape store you have to check out. This list wouldn’t be complete without the best online dry herb vaporizer store. This alone wouldn’t be enough reason to get the title of ‘best’ online dry herb vaporizer store though. And Planet of the Vapes proofs precisely that. Planet of the Vapes is the best rated online vape store in the world. They’re the only online dry herb vape store that provides a 14-day satisfaction guarantee. If you don’t like your purchase for whatever reason, you can send it back and get a full refund, no questions asked. This is the type of customer service every online store should provide. Your purchase doesn't get more risk-free than this. There’s no vaporizer store which has earned such a customer-friendly reputation as Puff It Up. The owner, Randy, is a very down to earth guy, really looking to please you in any possible way. And in case you find something cheaper elsewhere, they usually price-match, giving you the best possible deal. Looking at their assortment, you’ll quickly see that they have a vast variety of vaporizers and vaporizer accessories. Some vapes you won’t even find at other stores. They’re also usually the first ones to stock up on new vaporizers and accessories. The Puff It Up staff is also very knowledgeable; they’ll be able to answer most of the questions you have. This is without any doubt, one of the best online dry herb vape stores regarding prices and customer service. VapeWorld has been around for a longer time than most vape stores. From dry herb vaporizers to dab rigs to grinders, you will find it all at VapeWorld. But what distinguishes VapeWorld the most from the other stores, is they ALWAYS price-match in case you find a better offer. If I find a better offer somewhere else, why would I want to buy it ‘price-matched’ at VapeWorld? Well, VapeWorld has truspilot.com rating of 8.6 averaged out over 4000 reviews. Which means you can be 90% sure you’re getting a satisfying online shopping experience. 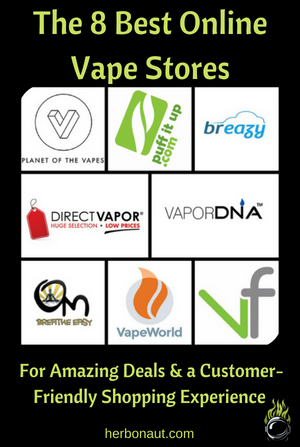 Today you got a list of the best online vape stores. Lastly, stay in touch with us! Become a fan on Facebook or follow us on Instagram by clicking the icons below.